Here’s what’s up in the world of TV for Wednesday, April 24. All times are Eastern. 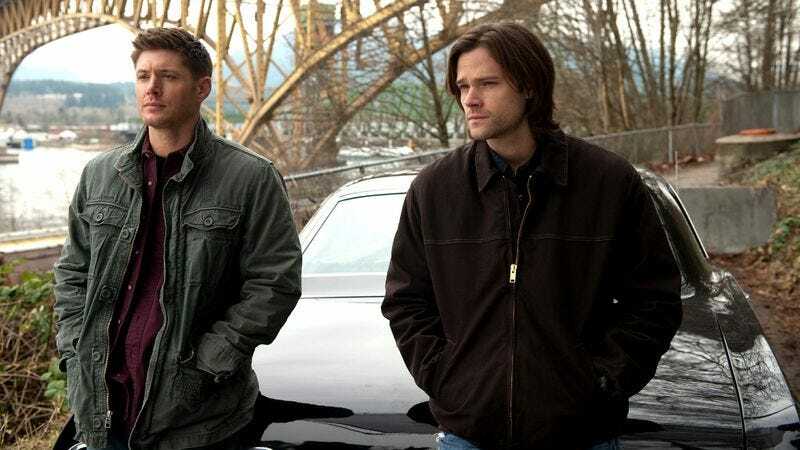 Supernatural (The CW, 9 p.m.): It’s the last night before May sweeps, which means many of the networks are taking the night off to horde their valuable programming for the weeks to come. Not The CW, though! It’s back with all new episodes of both of its shows, including an episode of Supernatural called “Pac-Man Fever,” which we can only assume is about the brothers Winchester tracking down and killing the mysterious giant Pac-Man of New Jersey’s Pine Barrens. Phil Dyess-Nugent has his rock salt, and he’s loaded for big, yellow monsters immortalized in Buckner & Garcia’s beloved pop anthem. Arrow (The CW, 8 p.m.): “Oliver recalls how Shado taught him to use a bow,” says TV Guide’s description of what’s sure to be tonight’s most riveting plot. In other news, however, Deadshot is back, and he’s been killing U.S. Ambassadors. Alasdair Wilkins wonders where Deadshot gets all this ambition. Survivor (CBS, 8 p.m.): With an episode called “Come Over To The Dark Side,” we’re really hoping that Probst takes the opportunity at Tribal to reveal that he’s one of the castaways’ father, with dramatic music stings and everything. Carrie Raisler would like one of you commenters to know she’s your aunt. The Americans (FX, 10 p.m.): The season ends next week, so the show’s plot summaries are getting much less explanatory, as they should. This week’s includes, “Stan achieves unexpected results,” which sounds exciting until Todd VanDerWerff and Genevieve Koski tell you it’s all about his miles per gallon. Psych (USA, 10 p.m.): Why don’t fans of this show call themselves Psych-os? We think that would adequately express their devotion to the program, and it would also be really confusing if they dropped it in casual conversation. Kevin McFarland isn’t really a Psych-o, but he is a psychopath. Don’t cross him! TV Roundtable (1 a.m.): The first time around, Futurama ended its run with an episode full of musical numbers, and our panelists are ending their look at TV episodes featuring musical numbers with a look at that episode. They’re also bidding farewell to one panelist, which is sad. There will be many tears. Slings & Arrows (1 p.m.): Last week, we met one Charles Eastman, the man who would play King Lear in Geoffrey’s version of the great play. Then we learned that he has some… difficulties, in addition to just being plain old. Todd VanDerWerff hopes you won’t hold those issues against Charles. He’s so charming! American Idol (Fox, 8 p.m.): The producers of this show were intent on having a female winner this year, and, sure enough, the women in the finals were much stronger than the men, to the degree that only women are left. And, of course, ratings are tumbling. We hope the contestants aren’t why. Nova (PBS, 9 p.m.): This week, Nova takes us to Australia 4 million years ago and reveals that it was filled with monsters. Sadly, the program doesn’t seem to feature the narrator promising monsters at the end of the episode, only to get to the end of the episode and realize the monster was himself all along. Duck Dynasty (A&E, 10 p.m.): Celebrate America’s “arts” and “entertainment” with the season finale of this hugely popular series, which our own Scott Von Doviak has argued is the true successor to the rural, working-class sitcom. We hope those guys finally get their dream ducks to finish out the season. I Was Murdered (Investigation Discovery, 10 p.m.): Far be it from us to stop anyone from paying homage to the famous narration structure of Sunset Boulevard, but this new show sure seems as if it’s promising it will be narrated by the murdered. Maybe they’ll all speak via psychics or something? Hm. Batman Begins (ABC Family, 8 p.m.): You’ve seen how the network promoted it—as a romantic film starring Christian Bale and Katie Holmes, more or less—now you can see what it looks like when it actually has to air the thing. Look, ABC Family: We’ll forgive everything if you just renew Bunheads. Flight Of The Phoenix (Cinemax, 8:05 p.m.): Though kind of a dumb and pointless remake, we found ourselves mostly enjoying this 2004 Dennis Quaid vehicle about a bunch of people who crash their plane in a desert and have to figure out a way to fix it up if they’re ever going to get back out. NBA Playoffs: Game 2: Rockets at Thunder/Lakers at Spurs (TNT, 7/9:30 p.m.): Your friendly local What’s On Tonight is based in Los Angeles, and when the Lakers almost didn’t make the playoffs—then did without Kobe—the local media gave in to weird, ritualistic mourning. It was all very, very strange. 30 For 30 (Tuesday): Alasdair Wilkins watches as ESPN takes a look back at the quarterback class of 1983, a class that included such all-time greats as John Elway, Dan Marino, and Alasdair himself. What? You’ve never heard of Alasdair Wilkins? That’ll teach you for not being a Jacksonville Jaguars fan!